With one button press on a keypad, the drapery can be opened, closed, or stopped midway to provide the desired amount of daylight and/or privacy. In addition, a gentle tug of the drapery fabric will trigger the drapery track’s motor, causing the fabric panels to automatically move along the track in that direction with no damage to the fabric or track system. Alena has the same ultra-quiet drive and smooth performance that are hallmarks of all Lutron shading system products. 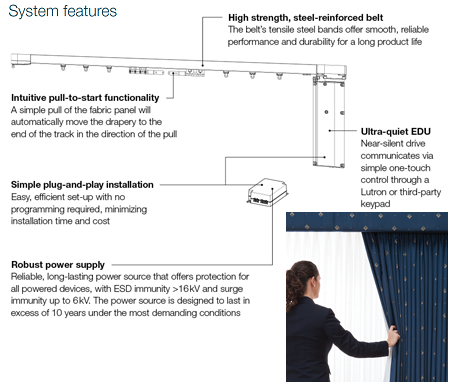 Installed easily as a plug-and play solution, using your own pinch pleat style draperies, the pull-to-start drapery solution requires no programming prior to use. Pinch pleat style is named for the pleated look created by pinched gatherings of the fabric at the top of the drapery. Pins on the back of the drapery are simply looped through the carriers on the track when installed. For the best system performance, a drapery hook setting of ½ in. from the top of the drapery should be used. Maximum system capacity of 105 lbs (47.6 kg). The draw style of your drapery is the direction in which the draperies open. The draw style determines where the stack back of the drapery will lay. Consider your application carefully when selecting a draw style. The Alena drapery track systems all offer pull-to-start manual activation When an occupant pulls on the drapery panel, the drive will take over and move the panel automatically to the Open and Close position. When using a keypad or remote control, the drapery will function as a motorized window treatment.